What is a basal cell tumor? This slow-growing tumor is a disordered overgrowth of cells of the epidermis, or outer layer of skin. 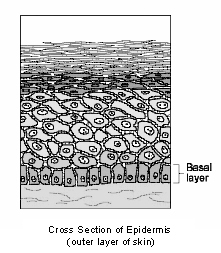 It gets its name from its resemblance under the microscope to the basal cell layer of epithelium (see illustration). The tumor cells show minimal organisation into the local specialized skin structures (such as hair follicles and their glands). Basal cell tumors merge in their classification into the closely related benign (non-life threatening and non-spreading) tumors of hair follicles and their accompanying sebaceous and sweat glands, called sebaceous gland tumors. "Usually, basal cell tumors are permanently cured by full surgical removal." Usually, basal cell tumors are permanently cured by full surgical removal. Spread to other parts of the body (metastasis) is extremely rare. In humans, most basal cell tumors develop in the areas of skin most exposed to sunlight (UVA and UVB radiation). In domestic animals this relationship is less clear, although the closely related, and more malignant, squamous cell carcinoma of the skin is associated with chronic exposure to sunlight. The sun's radiation causes non-lethal genetic damage of cells (mutations in the DNA genome). "Basal cell tumors are relatively common in middle-aged to old cats." Basal cell tumors are relatively common in middle-aged to old cats but are less common in dogs. A few develop in young animals. In cats, the tumors may occur anywhere on the body and are often pigmented. They may be more common in longhaired cats. In dogs, the tumor is most frequent on the head and neck. Problems are usually physical and dependent on the size and site of the tumor. Basal cell tumors frequently ulcerate and bleed and the ulcer may become infected. In humans, development of these tumors is sometimes related to damage to, or suppression of, the immune system. How is a basal cell tumor diagnosed? Your veterinarian may suspect that a mass is a basal cell tumor based on clinical findings. Accurate diagnosis relies upon microscopic examination of tissue. Your veterinarian may obtain this sample by performing a needle aspiration, a punch biopsy, a tissue biopsy or a full surgical excision. Cytology is the microscopic examination of cell samples, usually sucked (aspirated) from the tumor with a special needle. This can often help for rapid or preliminary identification of this tumor. Definitive diagnosis relies upon microscopic examination of stained sections of actual pieces of tumor (histopathology). Your veterinarian will usually send the sample, either a small part of the mass or the whole lump, to a specialized laboratory for examination by a veterinary pathologist. Histopathology also rules out other diseases including more serious cancers. The histopathology report includes words that indicate whether a tumor is benign or malignant. Malignancy is often shown by the word ending "carcinoma". These, together with the origin or type of tumor, the grade (differentiation or degree with which the tumor cells resemble normal cells) and stage (how large it is and extent of spread) indicate how the cancer will behave (the prognosis). Cancer very rarely disappears without treatment. Very occasionally, spontaneous loss of blood supply to the cancer can make it die, but the dead tissue will still need surgical removal. The body's immune system is not effective in causing this type of tumor to regress. After surgery, you will need to keep the operation site clean and your pet should not be allowed to interfere with the site. Report any loss of sutures or significant swelling or bleeding to your veterinarian. If you require additional advice on post-surgical care, please ask. Based on the histopathology, the pathologist will give your veterinarian a diagnosis, which helps to indicate how the tumor is likely to behave. The veterinary pathologist usually adds a prognosis that describes the probability of local recurrence or metastasis (distant spread). "Almost all basal cell tumors are benign, grow slowly and remain localized." Almost all basal cell tumors are benign, grow slowly and remain localized. However, they can recur following incomplete surgical excision. This occurs because it is difficult to remove a wide enough margin around the tumor at some sites. Sometimes cats will develop other, unrelated basal cell tumors at other body sites. In a few cases, the histopathological diagnosis is "basal cell carcinoma". This tumor will tend to recur locally although development is usually slow (months to years). Metastasis (spreading to distal areas) is very rare. "Basosquamous carcinoma" (basal cell tumor with areas of squamous cell differentiation) is more aggressive than most basal cell tumors. It may recur locally but this is rare, provided there is full surgical removal initially. These tumors do not spread or metastasize to other sites. No, this is not an infectious tumor and it is not transmitted from pet to pet or from pet to people.